I stumbled into this beautiful exhibition at Leslie Feely Gallery almost by accident. A mini survey of works by Frank Stella was on view in two elegant rooms. The works were made between 1971 and 1987. Historic yes, distinguished yes and a visual delight to encounter. To begin we find on entrance wall this Malevich quote: “….only he is alive who rejects his convictions of yesterday.” Later I found the same quote printed in a 1978 Stella catalogue from the Fort Worth Art Museum. This statement is a guide to what Stella has been about since the beginning of his long and extremely productive career. Stella over the past five decades has gone from young upstart previewed in 1959 in the Museum of Modern Art’s, Sixteen Americans to an acknowledged master with exhibitions and commission around the world and then decried by the same art world. Personally I have never lost interest in his work—my library attests to this with a variety of books and catalogues by a distinguished list of historians and writers including Harry Cooper, Philip Leider, Robert Rosenblum, William Rubin, Brenda Richardson and visiting shows whenever I could. Admittedly there are bodies of work that interest me more than others but this is the case with most artists. What I also appreciate and admire is his restlessness and almost relentless need for invention and exploration. He addresses painting as a proposition. In that proposition exist many solutions and permutations and the possibilities of precisely how far you could push the notion of painting into something that might actually evolve into sculpture. If Sol Lewitt moved painting from the canvas to the wall, then Stella moved painting into the third dimension. He made something come off the wall into the viewer’s space. Ironically both men rely upon an architectural setting to provide the context in which the work is to be presented. Lewitt needs a wall or walls that determine the height and length of a wall drawing, Stella the dimensions of a wall because his paintings are no longer bound by the limits of stretcher bar or frame. A few years ago I was fortunate to visit the artist’s studio in upstate New York. A giant factory setting in which works were on view, being stored and in process of coming to life. There is a wonderful abundance in the works: color, form, texture, materials all applied and then pushed to extremes. At that moment he was engaged in creating aluminum reliefs, multi dimensional structures that could hang off the wall or hang from the ceiling. Some clumsy, some elegant but he was working these out and developing variations on the themes he produced and wanting to create objects that were at once weightless and buoyant yet bold and graceful—indicative of an age in which painting and sculpture can meld. The earliest work on view in the gallery was from his Polish synagogue series. Reserved and controlled a different kind of concept when compared to his peers of the day. While many worked with the grid as a universal structure upon and around to compose, Stella was inspired by and moved by the imagery of unusual architectural forms that were no more and survived only in black and white photographs. The discovery of these buildings led to new ideas and works in which he studied the characteristic eccentric patterns and structures of these 17th, 18th and 19th century houses of worship. The decorative interweaving of wood patterns and forms spoke to him. In a 1983 catalogue from the Jewish Museum on the subject of this series the curator writes that Stella was inspired to use these innovative and complex models each with its own distinctive carpentry because of their “ originality of form and boldness of spirit”. With that in mind Stella produced a remarkable series in which he used unpainted wood, felt, collage and even aluminum. He did multiple versions of each some using flat materials others made use of raised materials attached to a wooden support. In the Feely show is Bogoria I 1971 typical of Stella’s ambition at the time. It is a complex arrangement of color contrasts and complimentary forms; cut out and assembled, which is to become a methodology Stella employs over the next four decades. He leaves behind the pictorial schemes of shaped canvases and flat areas of color. Simple geometry gives way to a more dynamic, dramatic and intuitive design. Stella may be inspired by the exotic shapes and forms of the Polish synagogue but he is using this as a jumping off point to build his own kind of painting once again unapologetically in his terms, his own bold spirit. With this step Stella leaves minimalism behind. His early Black paintings, the Protractor Series of the 60s all become history as he ventures towards an uncharted, personal and undefined field of exploration. The next paintings in this show explain much of what that field became and how personal he chose to go into the 70s. To my mind he came to realize that as fabricator he could control all aspects of the painting: not accidents but discoveries; less emotional connections and more thoughtful evaluations; not sorrow but pure joy. Stella can go big or small or somewhere in between. Other works of the 70s in the exhibition are equally balanced in terms of delineation of structure and the application of color. Stella plays and improvises with cutout shapes against and around a background in the Maquette for Montenegro,1975 from the Brazilian Series. The Brazilian series consisted of ten paintings, as well as maquettes and studies, and the Exotic Bird Series consisted of fifteen titles. The former is a group of paintings in which Stella focuses on the arrangements of rectangular bars balanced against and inter spliced with rectangular fields. The rectangles look as if they are calibrations of the space created between the rectangular bars. The latter series as in Green Solitaire, 1977 takes the same process one step further employing French curves and other drafting instruments and calligraphic stylized forms. All the works presented here are both accomplished and significantly intimate in scale. Though recognized mostly for larger scale works, at times even monumental if not excessive in their grandeur and proportions, this show illuminates Stella’s more quiet, restrained side. I like it. The works from the 1980s add even more three dimensionality to the painting so that they can be read as reliefs. Aluminum is cast, fiberglass is used; it’s a shop as much as it is a studio. Il Dimezzato # 7 is a compact arrangement of tubular elements and volumes making one think back to Picasso’s own experiments with his guitar reliefs of 1912. Monochromatic, the surface is left untouched amidst the cool neutral gray of the aluminum. The result is a tight composition of gray surface and black shadows. Another variant on this process of three dimensional assemblage is Playskool Door, 1983, which is again a multifaceted work made up of painted bronze and wooden dowels, wire mesh and perforated strips of metal. They are named after a line of children’s toys. Finally from the same decade Talladega, 1980-81, an arrangement of puzzle like aluminum parts twist and turned, parts pieced together. As if solving a jigsaw puzzle each highly decorated or painted is set in place on a rectangular field; some curved elements suggesting a section of a racetrack, nee the Circuit Series. Idiosyncratic, unique, cosmopolitan with titles derived from literature or music or a geographical locale. The topographical nature of these works demonstrates what one writer called the “ chaotic sea of images,” but it is this chaos that Stella harnesses to serve steady invention. In all these series gaps may occur so that the viewer sees the multiple levels on which the painting is built. Shadows and perforations become as much a part of the composition as color and light. Throughout the years Stella is an insistent colorist, adamant about the power, vitality and importance of abstraction. Even when many had dismissed painting and abstraction as representing a modern school of thought that was outmoded, Stella remained committed to his ideals. For many the world had moved into post modernism and the reappraisal of all things figurative and narrative. It was a matter of all or nothing and the 1987 retrospective seemed to many to be a reluctance to see the new and rely upon an old model. To a younger generation then raised on the exploits of the media and over supplied with information, Stella seemed the irrelevant formalist. Now a few decades later he would appear to be of greater interest to a variety of generations all exhausted from theory, irritated by the onslaught of media and anxious to see painting have its day again in a serious way, not simply as a token of art trading at art fairs or auctions. 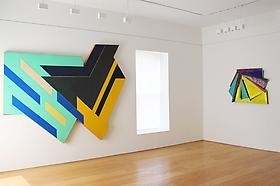 Frank Stella’s exhibition was on view at Leslie Feely Gallery through July 18th. Frank Stella (born May 12, 1936) is an American painter and printmaker, noted for his work in the areas of minimalism and post-painterly abstraction. Stella continues to live and work in New York. Michael Klein is a private art dealer and independent writer and curator based in New York City and Sharon Springs, NY.